Darcy Lee Donate Me Money So I Can Buy A House VirTual ReaLity Artificial Intelligence 911: Pray Without Ceasing - Test Everything, Prove All Things. 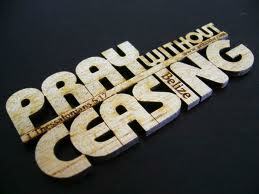 Pray Without Ceasing - Test Everything, Prove All Things. 1 Thessalonians 5:17 Pray without ceasing and 1 Thessalonians 5:21 Prove all things; hold fast that which is good KJV. Or NIV is Test Everything. When I was about 12-13 years old I remember thinking I should pray about something and at the time measuring to see if there would be any benefit any difference from me praying. Er anyway I prayed and found that there was an ever so slight benefit but it was only marginal. From this I came up independently of the bible with the words Pray Without Ceasing. This was my finding that you should pray without ceasing because in all things it would make an ever so slight difference for the better. Now the way I implemented this was to attempt to have all my thoughts as prayers. The streams of my thoughts I bent so they would be praying. Whatever that means. I just remember having like all my thoughts converging and the different streams being bent and manipulated so they would then be praying. Anyway I did come up with prayer without ceasing as a 12 year old without reading the bible. It came from praying and measuring the prayer and seeing if it actually did anything. I came up with the exact words "pray without ceasing" this was because in the beginning you could only move a small amount at one time. But eventually you hit the jackpot and your moving mountains after praying. The problem with all this is it's untested. I can't prove my method for praying without ceasing and I can't prove that prayer actually improves anything. As a child I thought I could actually measure prayer to see if it's working and also that every thought could be taken captive towards the goal of praying without ceasing. That every thought is a prayer and prayer included. But this all happened quickly and only got the once over. I don't have the same skills I did as a kid. Lol. Yeah it is unproven. Saying that I was surprised when I found the scripture Pray Without Ceasing as I had used those exact same words. Is God trying to prove my independent discovery of the words pray without ceasing. I do like the words test everything. I'll try and test alot more anyway. Most stuff from when I was a child never got tested, it just got believed. And I mean how do you like test half the stuff you come across anyway. I definitely enjoy testing my beliefs to find better truth or at very least the thought of testing. I mean how do you test everything we must have like a million thoughts every minute. I'm not to sure how to implement testing and proving everything and all things. I am working on testing everything but I don't have the same imagination of when I was a child. I would like to have known at the time of inception of ideas when I was younger to test them more as they have shaped what I believed later in life. Like I said alot of thoughts and ideas went untested. 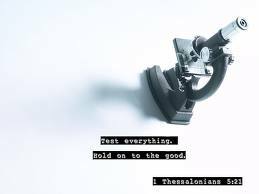 I at least now after reading scripture know to test stuff and suggest you also test your own thinking as much you can.